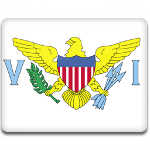 The Danish West India Company settled on part of the Virgin Islands archipelago, which is now known as the US Virgin Islands, in the 17th century. The trans-Atlantic slave trade to the archipelago began in 1673. Slaves mainly worked on sugarcane plantations. They were forced to work in difficult conditions and were treated inhumanely. This led to several large revolts, such as the 1733 slave insurrection on Saint John which lasted for six months. In 1835, Peter von Scholten became governor of the islands. He tried to lighten the burden of the slaves by permitting the private ownership and creating schools for them. When a non-violent slave revolt broke out on the island of Saint Croix in 1848, von Scholten decided to emancipate all slaves. Slavery on the Danish West Indian Islands was officially abolished on July 3, 1848. The anniversary of this event was declared a public holiday in the US Virgin Islands.